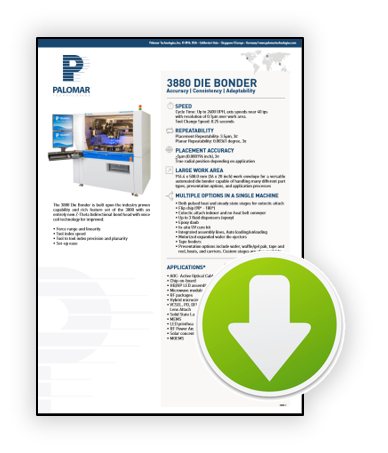 Palomar Technologies' 3880 Die Bonder component placement die attach system features a state of the art, integrated Z-Theta bidirectional 8-tool bond head, making it the fastest and most reliable multiple die-type bonder on the market. 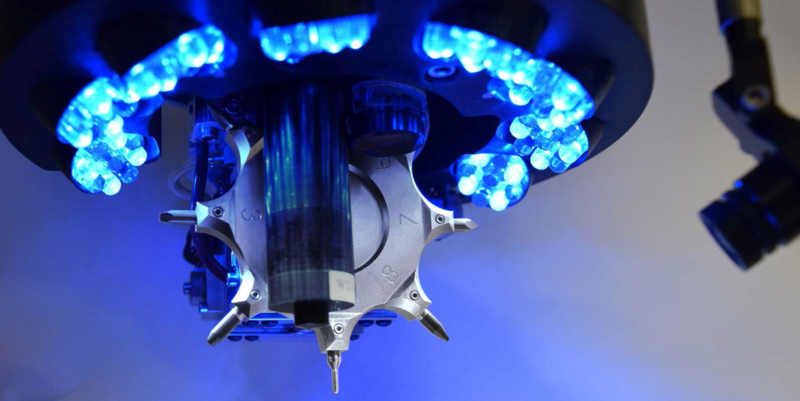 The machine’s 5um placement accuracy capability, 250 millisecond tool change time, and excellent tool-to-tool planarity offer its users a combination of high-accuracy and peak repeatability performance across a large work area. Presentation options include combinations of wafers, waffle/gel pak, inline conveyors for carriers and boats, tape and reel, and JEDEC tray feeders. Process optimization and speed improvements can be realized using robust fiducial and referencing technology. VisionPilot® with Radar Referencing® provides this pathway to optimization by using advanced geometric pattern matching technology. The result is reliable, accurate, and fast location of parts. Even under the most challenging conditions, this exclusive software can significantly reduce or eliminate fixturing requirements and costs. For locating parts or features, VisionPilot provides the maximum inspection yield and reliability. The 3880 Die Bonder utilizes a large work area, various presentation tools, steady state and pulsed heat system for eutectic bonding, high-accuracy motion system, multiple dispense technologies, die ejectors, and Cognex® Vision System. A sturdy mechanical structure, process camera, quiet linear motors, 0.1 micron linear XY encoders, and direct measure 0.00023 degree rotary encoder. Double-pick process protected under US Patent 6,776,327. Looking to learn more about Assembly Services?